1) On September 25, at 6:30pm, Legal Sea Foods in Park Square will host a wine dinner with selections from Feudi di San Gregorio’s extensive portfolio of Irpinian wines. True visionaries from the mountainous Italian region of Irpinia in Campania, Southern Italy, Feudi di San Gregorio focuses on blending the heritage and traditional flavors of Irpinian wine with a forward-thinking emphasis on art and modernity, encapsulating the excellence and esteem that the brand has commanded since its inception in 1986. Distinguishing itself from other Campanian wineries, Feudi di San Gregorio emphasizes its region, by explaining how the unique climate and environment of Irpinia cultivates a distinctly rugged, yet natural vineyard that sets Irpinian wines apart. A region characterized by mountains and woodlands, Irpinia boasts robust vineyards, grown naturally alongside fruit trees and forests, that take advantage of the region’s unique rainfalls and mild Summers to produce distinctly Irpinian grapes. With great respect for the traditions of the land, coupled with a comprehensive mastery of modern oenological techniques and an emphasis on art and design, Feudi di San Gregorio produces wines that piece together a mosaic of the communities, hills and cultures of Irpinia. 2) The Babbo Pizzeria e Enoteca team have banded together to support the victims of Hurricane Harvey by donating 100% of the sales of their designated beef dishes, from September 1-30, to the American Red Cross. 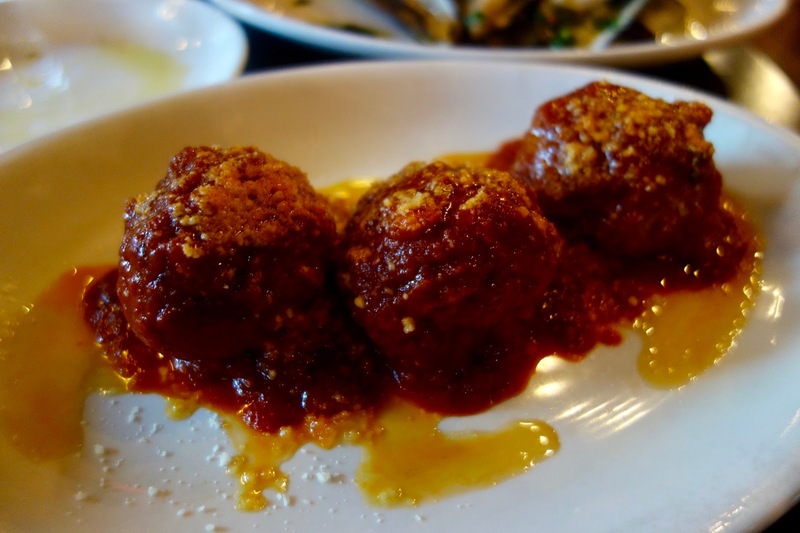 100% of the proceeds from Babbo's Beef Brisket and Pork Polpette will be donated to the cause. I recently had the polpette and it was delicious, tender and flavorful. So, enjoy some good food and help a much needed cause. For Reservations, please call (617) 421-4466. 3) Earls Kitchen + Bar soon will open their second Massachusetts location within The Shops at the Prudential Center in Boston’s Back Bay. Opening to the public on September 8, the new location will be Earls’ 10th and their largest concept in the United States. "Earls Kitchen + Bar, the iconic staple from Canada, strikes a balance of healthy and indulgent by offering a menu diverse in culinary experiences inside a lively, high-energy bar and dining environment complete with an unmatched rooftop patio where authentic hospitality takes centerstage." Earls has a fun cocktail menu curated by internationally renowned beverage director Cameron Bogue. Earls’ cocktail gurus will shake-and-stir modernized classics in addition to pouring authentic craft cocktails and balanced libations with a twist of novelty. They use freshly-squeezed juices, seasonal fruits, small batch syrups and market-fresh herbs. Check out cocktails like the Paper Plane (with Buffalo Trace bourbon, Montenegro, amaro, Aperol and fresh lemon), and Absinthe Minded (with Bombay dry gin, Tio Pepe Fino Sherry, Martini blanco vermouth, absinthe and fresh lime). Each month, Earls will feature a specialty cocktail that is available all day, every day for only $5; in the spotlight in September are four renditions of the Moscow Mule. Earls also features local and regional craft beer selections and an unpretentious wine list focused on quality and value that is curated by corporate sommelier David Stansfield, a wine educator and writer who is known for his wit and keen understanding of the wine experience. The wine list is presented in an easygoing fashion that is tailor-made for its Prudential Center location with a heavy focus on wines of Italy and classic biodynamic producers. Each Earls menu is unique to its local market and surroundings. At its core, Earls offers diverse selections ranging from bibimbap, jeera chicken curry, sushi and south-of-the-border specialties in addition to serving up classics like gourmet burgers, steaks and fresh seafood. Choices from its all-day menu include three types of Wings from traditional hot and Korean hot to Jamaican jerk; Blackened Swordfish Tacos in flour tortillas with melted white cheddar, roasted jalapeño crema, pico de gallo and fresh cilantro; a half-dozen burger options, including the Fenway Burger with battered onion rings, red pepper relish, aged white cheddar and lettuce on a freshly baked brioche bun; and, Steak & Sushi with tataki-style steak and ponzu sauce with a choice of a dynamite roll or spicy tuna sushi. 4) The SRV team and Nino Negri winemaker, Claudis Alonghi, invite guests to join them at their first-ever wine dinner on September 12th at 6:30pm. Established in 1897, the winery is located in the Vatellina valley in Lombardy, and primarily grows Chiavanesca, the local clone of Nebbiolo. One of their specialties is Sfursat, a wine made from grapes that are allowed to initially dry for about 100 days in the cool, dry, alpine air. Cost: Tickets cost $100 per guest, not including tax and gratuity, and will include a multi-course dinner paired with some of Nino Negri's top bottles. Fresh citrus flavors always taste especially good in the summer, whether you're eating a salad, enjoying grilled fish, or sipping a wine or cocktail. Last week, I tasted an intriguing and unique spirit, one with vibrant citrus flavors as well as much more. It was a perfect summer drink. I've been taken with some of the more unique Mezcal offerings from Pierde Almas, a Mezcal producer also devoted to being a socially, culturally and environmentally responsible company. Master Distiller & Owner Jonathan Barbieri is personable and passionate, an innovator who is helping to spread love for Mezcal. Check out my prior articles, Pierde Almas 9+ Botanicals: The First Mezcal-Gin and Pierde Almas & Mezcal de Conejo, for reviews of two of their other Mezcals, a Mezcal-Gin hybrid and a Pechuga made with wild rabbit. Now, I'm here to discuss one of their special Mezcals, made from a rare agave, the Pierde Almas Maguey de Lumbre Mezcal ($79.96), which I bought at Astor Wine & Spirits in New York City. I note that Astor is currently having a Mezcal sale, from August 28-30, with 15% off everything, so you can purchase this Mezcal right now for only $67.97. Maguey de Lumbre is a rare type of agave, usually wild though a small amount is cultivated. Little is known about this agave and there is even some disagreement over its nature. Some believe it is a type of Karwinskii agave, like Madrecuixe or Barril, but it seems more believe that it is a unique species. Jonathan Barbieri told me that it resembles Espadín, but has thinner leaves and a reddish tint which gives it the name Lumbre, which means "fire." Most often you will see Maguey de Lumbre used in Ensemble blends, and usually only a tiny amount will be added. Piedre Almas though chose to bottle a 100% Maguey de Lumbre and this is a special bottling, which is not made on a regular basis. Barbieri recently discovered that one of his producers has several hundred plants of Maguey de Lumbre, interspersed on a hillside among about a thousand Espadín. The Lumbre plants though are only 2 to 3 years old, so it'll be five or six years until they are ready to be harvested. Thus, there is only a very limited availability of the existing Pierde Almas Maguey de Lumbre and I highly recommend you pick some up. You won't regret it! How does it taste? Jonathan Barbieri told me, "It could be described however, like an great Espadín, only better. Somehow, rarer, purer - adjectives that I realize are completely unhelpful." Sometimes words are inadequate to properly describe a spirit or wine. In that instance, you must experience it for yourself, and then you may understand the nature of such a spirit or wine. After drinking this Mezcal, Jonathan's words made sense to me. The aroma was more subtle, with hints of citrus and smoke, but it was on the palate that this Mezcal grabbed my attention. The first taste was pure gustatory pleasure, a hedonistic revel in the complexities and flavors of the Mezcal. I didn't try to understand or analyze that first taste, rather letting myself experience what it brought to my mouth. This was a compelling Mezcal and once I started looking deeper, it only became even more intriguing. Citrus notes dominated the flavor profile but there was much complexity providing harmony to the spirit. There was also a mild smokiness, subtle herbal accents, and wispy spice notes. Just sit and sip it and you'll realize the fascinating complexity of this spirit. The taste was clean and smooth, and although it was 49% ABV, you probably wouldn't have realized the alcohol level was that high. It was an elegant pleasure, something to slowly savor on a summer evening, though you could certainly enjoy this year round. It is certainly a spirit you need to experience to best understand its nature. The Pierde Almas Maguey de Lumbre Mezcal receives my highest recommendation and I strongly urge you to let it light your fire. I also give my highest recommendation to the Mezcal producer, Pierde Almas, which is creating some amazing and unique Mezcals. I'll enjoy more of the Maguey de Lumbre this upcoming holiday weekend, and maybe I'll even share it with some family and friends. Rant: Want Ice With Your Wine? I brought a couple bottles of wine to a pool party, including an inexpensive and delicious Portuguese white blend. I shared the wine with my friends who were intrigued to try it. As I sat at a patio table, sipping my own glass of wine, I suddenly cringed when I witnessed one of my friends carrying two glasses of my wine. What made me cringe? He had ice cubes in both wine glasses. Ice cubes! Initially, it seemed like such sacrilege and I teased my friend about the ice. In one respect, the ice was a mistake. My friend had brought his own wine, and it hadn't been chilled, so his wife asked him for ice in her glass. Even though my own wine had been chilled, my friend still added ice to the glass, following his wife's wish. If she had known the wine was already chilled, she probably wouldn't have asked for the ice. In retrospect, I probably shouldn't have cringed at all. People are certainly entitled to drink their wine anyway they prefer and the wine was also inexpensive. And when I thought more about it, I realized that many of us also drink wine with ice, though we don't think about it very much. So, if many of us drink wine with ice, then we shouldn't be cringing when others also do so. Ever drink a glass of Sangria with ice? Most people have and the base of Sangria is wine. I don't see anyone complaining that Sangria is a sacrilege of wine because of the ice. Tonight, I'll be at a restaurant serving a few different Sangrias for the summer, and I'll likely partake, basically enjoying wine on ice. And I won't think anything wrong about it. There are a number of cocktails, which contain ice, that also use wine as an ingredient. That is seen as creative not cringeworthy. I still would cringe if someone added ice cubes to an expensive wine, even though they would be in their rights to add ice. 1) On October 13, from 7pm-9pm, Identità Golose, the international culinary organization highlighting the best of contemporary cuisine, hosts its inaugural dinner in Boston at Eataly Boston’s Terra, featuring acclaimed local and Italian chefs. Identità Golose, founded in 2004 by Italian food journalist Paolo Marchi, aims to highlight the best of contemporary cuisine and honor the chefs who proudly blend traditional techniques with modern methods. The first Identità Golose Chefs’ Congress was held in Milan in 2005, and many more have been held since, each one showcasing the greatest Italian and international chefs. In 2010, Identità Golose decided to share the talent of Italy’s finest chefs with an American audience and brought the event to Eataly New York, followed by Identità Golose Chicago in 2014. This year Identità Golose expands its US reach to include Identità Golose Boston. At the dinner, four celebrated chefs will wow guests with international dishes while discussing this year’s theme “Great Italy at the Table.” The dinner commences with an aperitivo welcoming guests to the restaurant followed by a seated, coursed meal featuring a refreshing seafood starter by Chef Michele Carter, a pasta dish compliments of Chef Caterina Ceraudo, a stuffed pasta dish from Chef Michael Schlow, and a hearty main course by Chef Chris Fischer, ending with a dessert created by Chef Caterina Ceraudo. Tickets are $150 per person and available on the Eataly website. 2) Executive Chef Matt Drummond, Bar Manager Kaitlyn Fischer, and the crew at Loco Taqueria & Oyster Bar continue endless summer with a special Luau-themed Labor Day Brunch on Monday, September 4, from 10am-3pm. Kick back, relax, and embrace the spirit of the islands with live music at this special Labor Day Weekend installment of Loco’s brunch featuring a variety of tropical bites and cocktails to toast to endless summer. In addition to Executive Chef Matt Drummond’s signature brunch items (Avocado Toast with marble rye, aji Amarillo goat cheese, smoked mahi mahi, avocado; Fried Chicken & Waffles with a jalapeno cornbread waffle and chile maple butter sauce and Breakfast Tacos with carnitas, scrambled cheesy eggs, smoked tomatillo salsa, chile de arbol) guests will be treated to tropical-inspired specials and ceviches. Those looking for a liquid brunch can sip on signature cocktails from Bar Manager Kaitlyn Fischer including the cult-favorite Coco Margarita and Rum Punch specials like the refreshing Watermelon and Pineapple Punch Bowls served in a hollowed out watermelon to keep the island vibes flowing or sip on the indulgent, newly-debuted Dirty B cocktail made with Myer’s Rum, Rum Chata, Kahlua, freshly muddled bananas, chocolate drizzle. 3) Tony Maws, Chef/Owner, Craigie On Main and The Kirkland Tap and Trotter is thrilled to welcome friend and fellow chef Seamus Mullen to his two kitchens on September 12 and 13. It will be Two Chefs, Two Nights, Two Dinners. Chef Seamus Mullen will be cooking some of the delicious, wholesome recipes featured in his new cookbook, Real Food Heals: Eat to Feel Younger + Stronger Every Day. Seamus, chef of Tertulia and El Colmado, both in NYC, recently had to confront his own health after a near-death experience brought on by an autoimmune disease he had struggled with for years. This battle has changed the way he cooks and eats both at his restaurants and at home, and he shares more than 125 Paleo inspired recipes in his new book, Real Food Heals. Tony is welcoming Seamus to the kitchen at The Kirkland Tap and Trotter. Seamus and Tony will bring the dishes to the table family style, speak with the guests and share stories. This is an intimate, candid dinner with two seatings of 12, at 6pm and 6:30pm. Beverage pairings will be available. Tony will welcome Seamus to his kitchen at Craigie On Main. Tony and Seamus will cook side by side, bringing seasonal ingredients to new heights from the perspective of Real Food Heals. This will be a very special and memorable evening with two chefs creating spectacular dishes that not only are seasonal but good for you too. Wine pairings will be available. Confession Time: Back during my college years, one of my favorite wines was Riunite Lambrusco, which was fruity and sweet. At the time, it was extremely popular and I didn't know much about wine. Flash forward to the present, and Lambrusco is being highlighted in the media, though it isn't Riunite that is receiving all the attention. Instead, there are a number of producers, mostly in the Emilia-Romagna region of Italy, producing a diversity of intriguing and delicious Lambrusco wines, much more serious than Riunite. Lambrusco is both the name of the grape as well as the wine made from that grape. However, there are actually a number of varieties of the Lambrusco grape, such as Lambrusco Grasparossa, Lambrusco Maestri, and Lambrusco Marani. It is an ancient grape, extending back to a vine that was known to the Romans as labrusca. In recent years, I've enjoyed a few Lambrusco wines, though I haven't seen many available locally. Very recently though, I thoroughly enjoyed a Lambrusco that was new to me and it certainly set a benchmark for future Lambrusco wines I'll taste. At Sips of Summer: A Wine Tasting With Adam Japko, organized by ASID New England and New England Home Magazine, Adam selected five excellent wines to pair with various foods. The opening wine for the event was the 2016 Vigneto Saetti Lambrusco Salamino di Santa Croce ($18.99), and it hit a home run. It was an amazing wine, sure to thrill and excite any wine lover. And at this price point, it is a very good value as well. The Vignetti Saetti Winery was established almost twenty years ago, in 1998, by Luciano Saetti, whose first career was as an egg distributor. Actually, in 1964, his family planted the original vines, farming organically, though they sold off most of their grapes. Luciano has continued the organic practices, including acquiring organic certification. His small vineyard, located in the Santa Croce appellation of Emilia-Romagna, consists of only about 2.8 hectares. Luciano planted the Lambrusco variety of Salamino di Santa Croce, which received its name because its bunches are more cylindrical, reminding you of the shape of a salami. This variety is more thick-skinned, darker-colored and higher in acidity than other Lambrusco varieties. Besides embracing organic grapes, Luciano also uses only native yeasts and doesn't add any sulphur to his wines. Thus, many people will consider his wines to be natural. Most Lambrusco wines are produced with the Charmat method, undergoing a secondary fermentation in a pressurized tank. However, Luciano decided that the secondary fermentation for his wines should occur in the bottle, more like the méthode champenoise. The bottles are also riddled and disgorged by hand, making Luciano's choice the more laborious and time consuming. However, it is clear he believes his wine is better because of those choices. The 2016 Vigneto Saetti Lambrusco Salamino di Santa Croce is produced from 100% Salamino di Santa Croce, from 40+ year old organic vines. The wine is a deep, almost purple color, with an alluring aroma of berries, violets, mild spices, and a hint of earthiness. On the palate, it has a creamy effervescence, with enticing, dry and juicy flavors of black cherry, raspberry, and ripe plum, with an underlying earthiness and mild spice notes. The tannins are well-integrated, the acidity is strong, and the finish is lengthy and pleasing. Although a number of sulphur-free wines possess a certain funkiness, this wine lacked that quality. It was easy drinking but with plenty of complexity, the type of addictive wine which you'll likely finish the entire bottle before you know it. This wine is so far from Riunite Lambrusco! Get over your preconceptions about Lambrusco and pick up a bottle of this wine. It is an excellent value and is also very food friendly, from pasta to burgers. It would also be a great choice for the summer, as well as the fall. Kudos to Adam Japko for introducing me to this killer wine. Two weeks from today will be Labor Day, which many see as the end of summer although autumn won't officially arrive for a few weeks more. Besides the change in the seasons, Labor Day is also the unofficial start of wine tasting season. From September to December, most wine stores will hold large-scale wine events, some where you can taste more than fifty wines. Even better is that most of those events will be free, or they will charge only a nominal fee. This is your opportunity to taste many dozens of wines, and you should seize the chance to do so. As I've mentioned many times before, the best way to learn about wine is to taste it, and taste even more. The best way to learn through tasting is to expand your palate, to taste plenty of unfamiliar wines, to experience different grapes and to sample wines from new regions. You could easily attend these events and drink only wines you know but why do that? It won't teach you anything. It won't provide you a new experience. You learn something from what is new. And what you learn might also bring you much joy. Sure, you probably won't like everything new you taste but that shouldn't be an issue. You are only sampling the wines, taking a sip or two, and it is probably for free. If you dislike a wine, if might help you understand what wines you will enjoy. And amidst all that tasting, you'll probably find a number of other wines that you do like, and may even find a new favorite. Take the risk, expand your palate and taste as many different wines as you can. And a little more advice. When you attend these tastings, take some notes so you remember which wines you liked. Don't rely on your memory alone because after tasting a couple dizen wines, you probably won't remember your favorite wine the day after. At the very least, use your smart phone to take a photo of the label. That is the easiest way to remember the wines that impressed you. 1) Viale, Cambridge’s modern-Italian restaurant, is introducing a signature hand-made pasta Brunch Menu, elevating the typical avocado toast with innovative pasta options. 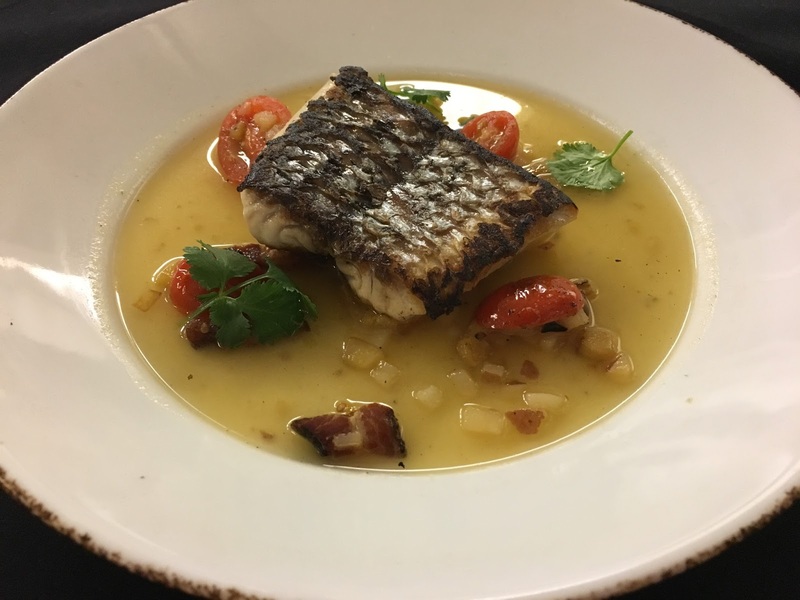 Executive Chef/Co-Owner Greg Reeves is looking to give his guests an authentic Italian feel while enjoying the popular weekend meal, using fresh, house-made pasta options and seasonal, locally sourced ingredients. “People have a stigma that pasta has to be filling or too heavy for certain meals, and when I was creating the menu for our brunch options, my main goal was to prove that wrong. 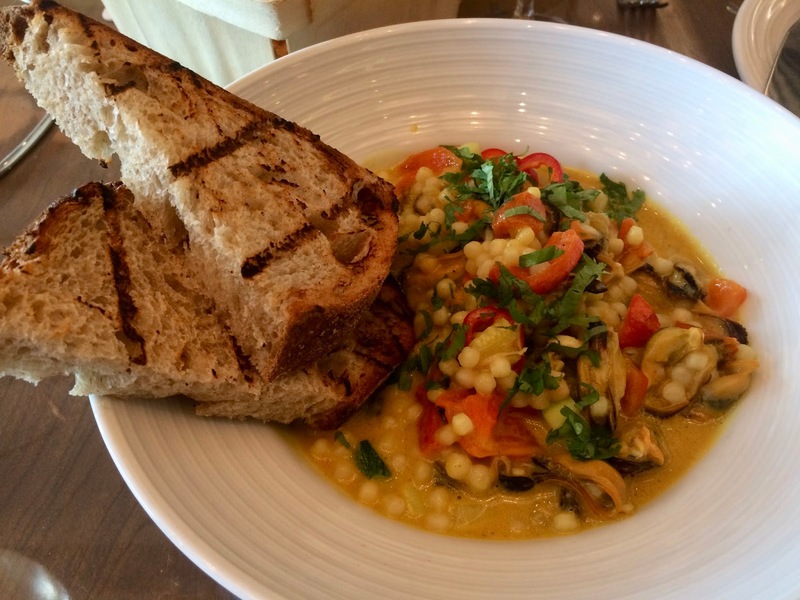 You most certainly can incorporate a fresh, hand-made pasta option into a classic brunch dish, and I think guests will try these dishes and stop carb-shaming,” said Chef Reeves. Still seeking adventure without the pasta? Enjoy unique twists on brunch staples such as Eggs Benedict with North Country bacon, egg, ricotta, and grana ($13), Crispy Duck & Buckwheat Crespelle with fried eggs, and roasted corn ($14), and the Brunch Burger with North Country bacon, fried egg, provolone, Russian dressing, and French fries. Let the pasta balance out one of Viale’s hand-crafted cocktails like Prosecco Correcto with grappa di moscato, muscat grape shrub, grapefruit, prosecco, lavender ($12), School’s Out with earl grey montenegro, gin, orchard apricot, peach puree, lemon, becherovka ($12), and Victim of Venus with blueberry infused cocchi rosa, vodka, amaretto, lemon, creme de violette ($12). To make a reservation, please call (617) 576-1900. 2) Puritan & Co. Chef/Owner Will Gilson and fellow chef friends will be joining forces to pay homage to one of Cambridge’s culinary legends, Julia Child. On Thursday, August 24th, at 6:30 p.m., Puritan & Co.’s Will Gilson alongside other local chefs will celebrate the life and culinary adventures of one of the culinary world’s greatest heroes, Julia Child, with a family-style menu inspired by her classic recipes. Each chef will prepare one course inspired by his or her favorite Julia Child recipe- offering guests a unique, collaborative dining experience. Contributing to the evening’s meal will be Leo Asaro of Tico, Dave Bazirgan of Bambara, Kevin O'Donnell of SRV, Shaun Velez of Deuxave, and Ellie Wallock, Puritan & Co. This dinner will be seated in a communal style at larger tables with each dish served individually. Carafes of wine on each table will be kept full for all to share with Puritan and Co.’s full wine and cocktail list available for purchase. 3) On Sunday, August 20th, Babbo Pizzeria e Enoteca will transport guests to their Nonna’s kitchen for a classic Italian Sunday Supper. The multi-course meal will cost $40 per person with an additional wine pairing available for $20. A 5 and 7 p.m. seating are available and walk-ins/reservations will be accepted. 4) Chef/Owner Michael Schlow and the Tico Boston team invite guests to a unique experience with a choice between two featured Casamigos cocktails paired with light bites and mingling. On Tuesday, September 12th, from 6:30pm-9:30pm, Tico will be hosting a unique experience featuring Casamigos Tequila cocktails, light bites, and sit-down, family-style dinner. The evening will include a welcome reception featuring passed appetizers and a Casamigos cocktail; followed by an educational component; and will finish with a delicious family-style dinner. The Casamigos brand ambassador will share the history of tequila. 1oz pours of Blanco, Reposado, and Anejo will be sampled and sipped. After the educational component a family style dinner will be served highlighting guests favorite menu items of the moment. The event is limited to 25 guests to keep everyone involved and attended to during the educational aspect. "So I guess this is where I tell you what I learned - my conclusion, right? Well, my conclusion is: Hate is baggage. Life's too short to be pissed off all the time. It's just not worth it. Derek says it's always good to end a paper with a quote. He says someone else has already said it best. So if you can't top it, steal from them and go out strong. So I picked a guy I thought you'd like. 'We are not enemies, but friends. We must not be enemies. Though passion may have strained, it must not break our bonds of affection. The mystic chords of memory will swell when again touched, as surely they will be, by the better angels of our nature." With the tragic events unfolding in Charlottesville, Virginia, the hate that is spewing from ignorant racists, the violence that has led to death and numerous injuries, we need to stand united against the forces that seek to divide our country. We need to embrace diversity, opening our minds to new ideas, and to eliminate our biases and prejudices. Embracing diversity will only make us better human beings. And don't we all want to be better people? As a tiny contribution to this issue, I want to once again showcase local people of color who blog/write about food & drink. I previously highlighted women who blog about wine, and it has been an extremely popular post. It helped to bring to the forefront all the valuable contributions and unique voices of these bloggers. Now, I want to expand the scope and highlight the unique viewpoints from people of color as well. I have done this before but I think on light of recent events, it would benefit us all to post about it again. I've been blogging about food and drink in the Boston area for almost twelve years, and the vast majority of bloggers I've seen at local events have been white. I've spoken about this before, stating we need to find ways to attract more people of color to these events. An initial step would be to identify those people of color who blog, to showcase their talents. This could be a motivation for other people of color to get involved and start blogging too. It will also present blogs with different voices, a way for all of us to expand our own experience and knowledge. The following is an initial list of people of color, living in Massachusetts, who blog/write about food and/or drink. This is by no means a comprehensive list but provides a starting foundation. Check out these food & drink blogs and I am sure you will like what you find. If you are or know of any other local people of color with food & drink blogs that are not on this list, please have them send me their info, including their name, URL and a brief description of their blog, and I will add them to the list. 1) A Jack's Abby Beer Social will be held on Tuesday, August 15, from 7pm-9pm, at Tavolo Ristorante. They will be showcasing five beers from Jack's Abby. Tickets get you a Jack's Abby beer glass and small pours of each beer, each served with a tasty pairing from the Tavolo kitchen. At the end they'll give you a full pint of whichever beer was your favorite. The event starts at 7 pm but please arrive a few minutes early to check in and get comfortable. Limited space available so sign up soon! 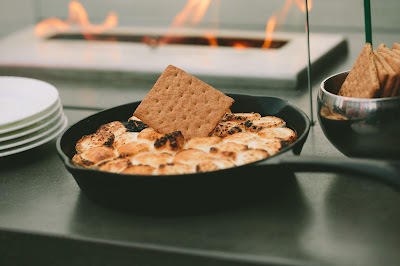 2) Today is National S'Mores Day so let me provide you a couple ways to celebrate. First, you can get your fix at TAMO Bistro + Bar at the Seaport Hotel. 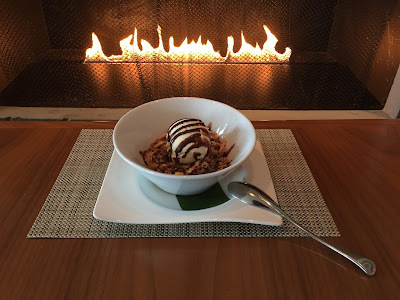 They are offering S’mores in a Crock ($9), a "warm, indulgent deconstructed s’mores bowl topped with vanilla ice cream." It is made with Graham crackers, chocolate chips, mini marshmallows, and vanilla ice cream. Enjoy it in front of one of the fireplaces at TAMO or outside on TAMO Terrace. 3) Another option to celebrate National S'Mores Day is at ArtBar Cambridge. They have a special Fire Pit Menu served all summer by the beautiful fire pits overlooking the Charles River. They offer creative spins on campfire favorites, served in cast iron skillets, and are meant for sharing. For dessert, they offer their S’mores Skillet ($15) with home-made marshmallow, chocolate ganache and salted bourbon caramel drizzle. I've had this before and it is a decadent and delectable dish. Highly recommended! Do you have a favorite recipe that your mother makes, something you've enjoyed your entire life and which still brings a smile to your face and gives you a happy belly? Yesterday, my Monday morning was brightened by my mother (pictured above) baking one of my favorite foods, Cinnamon Rolls. I went over to her house and watched her whip up a few batches of cinnamon rolls, and I was able to savor them still hot out of the oven. Sheer bliss! When my mother was 14 years old, and in the Girl Scouts, she learned a recipe for cinnamon rolls and she has been making them throughout her life. The recipe hasn't changed except sometimes she also makes an icing for them. As a child, I loved these cinnamon rolls and my love for them hasn't diminished one iota. They still make me so very happy. Besides being delicious (who doesn't love cinnamon? ), they also are a sign of my mother's love. Plus, there is a bit of nostalgia there, a hearkening back to my childhood. They are a perfect comfort food, which I would eat year round. A simple item but with so much complexity attached to them. Do you have a similar food or dish in your life, something your mother created, and still does, something indicative of her love? These are the cinnamon rolls, ready to be placed into the oven. And these are the cinnamon rolls, ready to eat. It takes much discipline not to devour the entire plate. Let me share my mother's recipe for Cinnamon Rolls, so you can feed your belly and heart. Mix together the Bisquick and water with a fork until it forms a dough. Then spread a flat surface with some Bisquick as you might with flour. Roll out the dough into a large square. Spread a thin coat of melted butter over the spread-out dough. Then mix cinnamon and sugar together and sprinkle it over the dough. Roll the dough like a jelly roll and then slice the roll into pieces about three to four inches wide. Place the pieces on a cookie sheet and bake at 350 degrees for about 15 minuutes, until brown. Enjoy them while they are still hot. There is National Chardonnay Day and National Cabernet Sauvignon Day. There are also Wine Days celebrating Merlot, Moscato and Champagne. Plus, there are Drink Days celebrating everything from Rum to Egg Nog, Margaritas to Mai Tais. The basic idea behind such days is to promote a grape, wine, beer, spirit or cocktail, and savvy marketers take the opportunity to highlight and push their products. However, do we really need all of these wine/drink holidays? For the more popular choices, like Chardonnay and Cabernet Sauvignon, I don't think we especially need a special day to showcase these grapes. They are already hugely popular and there are many other grapes more worthy of attention, grapes which are less popular or less known. There are plenty of under appreciated grapes and wines, such as Assyrtiko, Rkatsiteli, or Sherry, which would benefit much more from their own special day. They need the publicity, to boost their sales and recognition. There are other alcohols worthy of more attention to, from Mezcal to Sake. I would much rather see days celebrating the drink underdogs, helping to gain them recognition and new fans. I want people to broaden their palates, and taste something new for them. They need to be enticed to step out of their comfort zone. For example, Sake is still vastly under appreciated in the U.S. so having a day that celebrates and promotes it makes sense. Did you know International Sake Day has existed since 1978? That makes it far older than most, if not all, of the other wine and drink holidays. 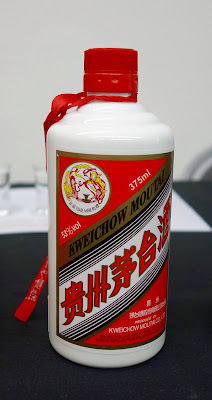 This Wednesday, August 9, is World Baijiu Day, a holiday created by Jim Boyce, who runs the nightlife blog Beijing Boyce and wine blog Grape Wall of China. The intent of the day is to raise awareness of Baijiu, to highlight its wonders beyond the borders of China. Even though Baijiu is the most popular spirit in the world, most Americans know little, if anything about it. 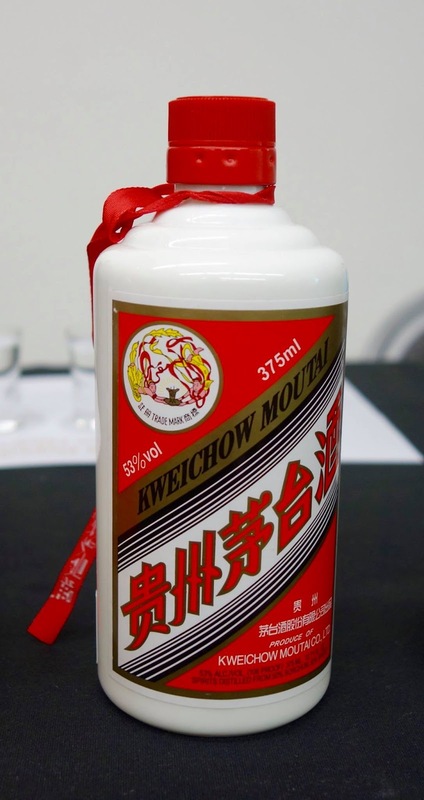 As I've said before, Baijiu seems to be the Durian fruit of the spirits world, both having a reputation for funkiness which turns off some people, while others become fervent fans. It is a compelling beverage and I strongly encourage everyone to seek it out and sample some of its wonders. When is the last time you saw a Boston-area writer pen an article about Baijiu? It is a rarity, indicating that more attention needs to be paid to this spirit. Not enough people are writing and talking about this unique beverage, despite its fascinating history, production methods, and customs. We need to change this and World Baijiu Day can help spread the word, and maybe entice more writers to talk about Baijiu. Last year, I wrote seven articles about Baijiu, covering a diverse selection of topics, from Baijiu reviews to an detailed explanation of its production methods. This is a great place to start your education about Baijiu. In celebration of World Baijiu Day, there will be events held all over the world, from Beijing to Liverpool, Stockholm to Los Angeles. In the Boston area, there is a single restaurant celebrating this holiday: Sumiao Hunan Kitchen, a new restaurant in Kendall Square, Cambridge. Sumiao carries five different Baijiu, including three by the bottle, Maotai ($288), Wuliangye ($188) and Luhzou Laojiao ($118), and two by the glass, Hong Kong ($11) and Jiannanchun ($16). In addition, they have four Baijiu cocktails ($14 each), including: Schrodinger’s Coupe with Hong Kong, curaco, grapefruit, lime and plum bitters; Ice Cold Fusion with Mianzhu Daqu, cognac, triple sec and lemon; Perpetual Motion with Mianzhu Daqu, blood orange, lime, elderflower liqueur and mint; and, Pyroclastic Punch with Hong Kong, Fruitlab hibiscus liqueur, passionfruit cordial and lemon. Check out my prior post about Sumiao, with my thoughts on all four of these delicious cocktails. Baijiu is also becoming more readily available at liquor shops in the U.S., though previously you might not have even realized it existed. Baijiu may be hugely popular in Asia but it needs much greater exposure in the rest of the world, including in the U.S. It is a unique and delicious spirit and well worth seeking out. This is a Drink Day that I wholeheartedly support and hope that everyone else takes this opportunity to acquaint themselves with Baijiu. Stop by the new Sumiao Hunan Kitchen, experience some of their tasty Hunanese cuisine, and have a Baijiu cocktail. I plan on stopping there at lunch time for a Baijiu cocktail. Will I see you there? Expand your palate and try something different and more unique. Drink some Baijiu and celebrate World Baijiu Day! 1) Diane Kochilas, award-winning cookbook author, television personality, consulting chef, teacher, and one of the world's foremost authorities on Greek cuisine, will launch her delectable cooking program this October - My Greek Table With Diane Kochilas. Premiering October 4 on public television stations across the country (check local listings) with 13 episodes, the series takes viewers to the source, as Diane introduces the stunning vistas, fabulous food, easy, nutritious recipes, and the unmatched hospitality Greece is known for worldwide. My Greek Table With Diane Kochilas is more than a travel-cooking show. The series is a thorough exploration of the original Greek-Mediterranean Diet, shot on location throughout Greece in places such as Crete, Santorini, Ikaria, Lesvos, Thessaly, Macedonia, the Peloponnese, and Athens, as well as in a beautiful kitchen in Athens. 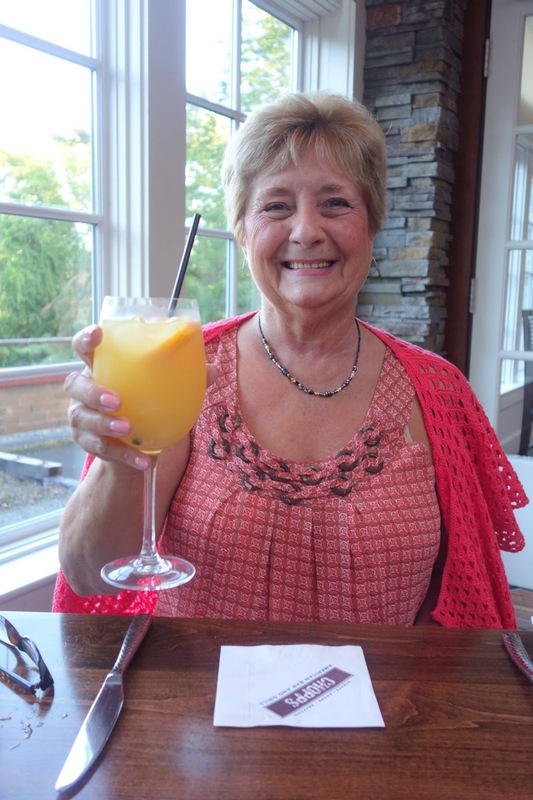 Diane delves into the breadth and variety of Greek cuisine, with regional specialties, an array of delicious vegetable and bean dishes, healthy desserts, and, yes, those iconic classics, too, from Greek salad to souvlaki! There will also be an in-depth look at the key ingredients of the Greek-Mediterranean Diet: extra virgin Greek olive oil, real Greek feta and Greek yogurt, wild herbs and healing herbal teas, whole grain breads and rusks, greens and vegetables, fish, honey, wine and more. Everything Diane showcases in My Greek Table is accessible to her American audience. "Greek cuisine is healthy, delicious and extremely varied. It goes way beyond baklava and gyros," says Kochilas, a New York native who now resides in Athens. "With My Greek Table, I want to reveal a country and a culinary point of view that feeds my soul and has shaped me into the person and chef that I am today." 2) On Thursday, August 10, at 6:30pm, Legal Sea Foods in Park Square will host a wine dinner with selections from Michele Chiarlo’s extensive portfolio of Piedmont wines. A Piedmont staple, Michele Chiarlo and his family have been making wine in the region since 1956. With estates in the finest appellations of Piedmont, the Chiarlos produce fine Italian wine upholding the time-honored tenets of tradition, discipline, sustainability, passion and care. Cultivating over 110 hectares of vineyards across the Piedmont landscape, Michele now works alongside his two sons, Stefano and Alberto, to ensure that the rigorous quality expected of Chiarlo wines is properly maintained, as they expand their operations across the Italian countryside. With great respect for the terroirs and vines that make the tradition of Italian wine possible, the Chiarlos continue to make quality, artisanal wine firmly rooted in the traditions and history of the Piedmont region, distinguishing the family as one of Piedmont’s most honored winemakers. 3) TAMO Bistro + Bar at the Seaport Hotel is offering three striped bass specials that will satisfy your cravings in the best possible way: Striped Bass Kabobs ($14), Striped Bass with Spicy Gazpacho, new potatoes & bacon ($30) and Beet-Cured Striped Bass, with tomatoes & watermelon. These specials will be offering in addition to the regular menu every day from 11:30am – midnight through the end of August. I often love the Kimoto/Yamahai styles of Sake, which can taste earthy with lots of umami and higher acidity. Because of their high level of acidity and umami, they can pair well with many different foods. Kimoto was the original method of production, basically where large oar-like poles, referred to as yamaoroshi, were used to stir the moto, the yeast starter. For hundreds of years, this process was conducted in Sake breweries all across Japan. It wasn't until the beginning of the 20th century, did someone realize that this laborious process was completely unnecessary. In 1909, Professor Kinichiro Kagi, at the National Institute for Brewing Studies, realized that the use of the oar-like poles to mix the moto wasn’t necessary. The moto could be left on its own to complete the process, although a couple adjustments were required, including adding some more water and raising the temperature a bit. Yamahai is short hand for "yamaoroshi haishi moto," which roughly translates as "creating the moto without the use of oar-like poles." To hone this new method, Professor Kagi conducted some experiments at the Suehiro Sake Brewery, located in Aizu, Fukushima Prefecture. Once Professor Kagi left the brewery, the next Toji working at Suehiro decided not to use the Yamahai process. Eventually though, the brewery would revive this method, using it for many of their premium Sakes. As an aside, a few years after the discovery of the Yamahai process, brewers realized there was an even easier method. If they added lactic acid to the moto, they could cut the required time in half and it was also a much less risky method. This became known as the Sokujo method and is now the most commonly used method, though some breweries still make at least some of their Sake with either the Kimoto or Yamahai methods. The Suehiro Brewery was founded, in 1850, by Inosuke, from the Shinjo family, which was a Sake supplier for the Lord of Aizu, Hoshina Masayuki. Inosuke eventually went out on his own, founding Suehiro, and it has been a family business for eight generations, becoming one of the largest Sake producers in the Tohoku Region. The Suehiro Densho Yamahai Junmai ($26.99/720ml) is produced from Gohyakumangoku rice, which has been polished down to 60% (which technically would make it a Ginjo). It has a Sake Meter Value of +1, so it is basically neutral with a 15.5% ABV. This seems to be a very typical Yamahai Sake, with delicious earthy notes, high acidity and plenty of umami. It is easy drinking, smooth, and complex with a hint of citrus, smoke, and sweetness. Simply a delicious Sake, which will pair well with many different foods, from mushroom risotto to a grilled steak. It went well with our dinner of a stir-fry shrimp and noodle dish. Highly recommended! Muscadet & Oysters. It's almost a cliche wine pairing but there is also much truth to be found. Muscadet is a white wine, produced at the western end of the Loire Valley, near the city of Nantes, in the Pays de la Loire region. With its proximity to the sea, briny oysters are readily available in this region, and they commonly pair very well with the local Muscadet. However, Muscadet is versatile, pairing well with far more than just oysters. The name “Muscadet” refers to common characteristic of the wine, which in French is “vin qui a un gout musqué,” basically translated as “wine with a musk-like taste.” Muscadet is made from the Melon de Bourgogne grape, which was probably initially planted in the 1600s, if not earlier, and was imported from the Burgundy region. Burgundy chose to uproot many of their own Melon de Bourgogne vineyards and today only a tiny portion remains. Melon didn't begin to attain dominance in the Loire until soon after 1709. What happened was that there was an extremely terrible freeze in 1709, destroying many of the other vines, but Dutch traders found that the Melon de Bourgogne was very hardy and encouraged massive plantings. Melon de Bourgogne is a relatively neutral grape, similar in that respect to Palomino, the famous grape used to produce Sherry. French winemakers discovered ways to transform the Melon into compelling wines. One of the most important techniques is sur lie aging, where the wine stays in contact with the lees after fermentation. Other techniques include oak barrel fermentation, bâtonnage (stirring the lees),and extended maceration. There are four main appellations of the Muscadet region: the generic AOC Muscadet (which covers the entire region); Muscadet-Sèvre et Maine (which produces about 80% of the region's wine); the Muscadet-Coteaux de la Loire; and the Muscadet-Côtes de Grandlieu. Muscadet is the most commonly produced wine in the Loire region. Muscadet wine is commonly light, dry, and may have a slight effervescence, which in the region is referred to as "pearls of youth." The flavors can include green apple, a certain yeastiness or even a touch of saltiness (like a manzanilla sherry). As I wrote yesterday, though I've previously enjoyed a number of Muscadet wines, this past weekend was the first time that I've tasted a Sparkling Muscadet. While dining at Island Creek Oyster Bar in Burlington, we ordered the Julien Brand La Bulle De L'Oueste Petillant Brut ($40/bottle at the restaurant, $20/bottle at retail stores). Julien Braud is from the small village of Monnieres in the Sèvre et Maine appellation, where he worked on the family estate, Fief aux Dames, which they have owned for over a century, producing Muscadet. In 2012, Julien decided to venture out on his own, taking three hectares of his family's estate, and now he currently possesses seven hectares. He practices organic agriculture, with the addition of some Biodynamic practices. In the winery, he uses natural yeasts and ages his Muscadet on the lees in glass-lined, underground cement vats. The Julien Brand La Bulle De L'Oueste Petillant Brut is made from 100% Melon de Bourgogne grape, is certified organic, and was fermented by the Methode Ancestrale, also known as Pétillant-Naturel. In short, this method allows the initial fermentation to finish in the bottle, trapping carbon dioxide in the bottle, creating bubbly. It has a low 9.8% ABV, meaning you can have an extra glass without worrying much about getting too tipsy. Only 450 cases of this wine were made though, so it could be difficult to find, though locally it is distributed by Arborway Imports. As I raised the flute to my nose, visually delighted by the tiny bubbles, I was entranced with this wine, loving its appealing and intense aromas, such beautiful fruit with a wisp of the ocean. On the palate, there was lots of crisp acidity, delicious citrus notes, and a steely minerality with an herbal hint. It was fresh and tasty, each sip making you crave more. We enjoyed the wine so much that we ordered a second bottle. 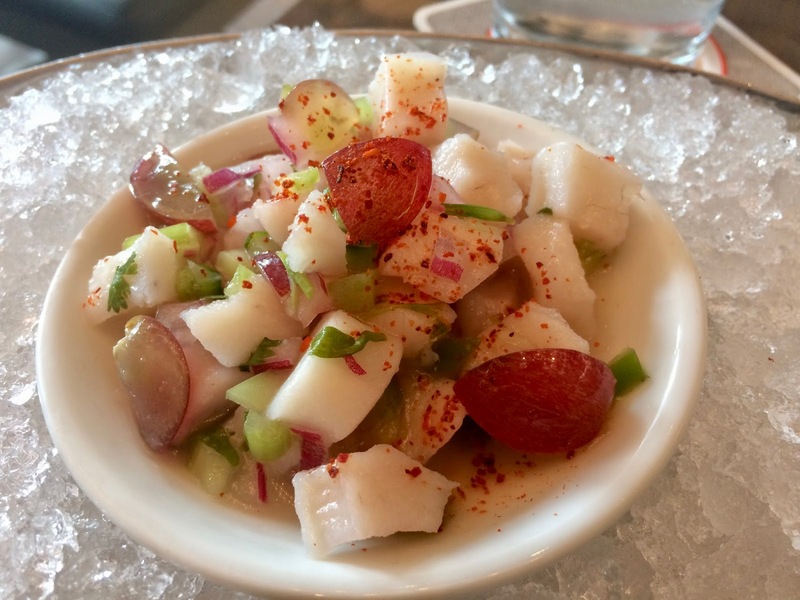 Though the Muscadet was wonderful with our oysters, it also went well with the fresh and bright Striped Bass Ceviche. The Unshelled PEI Mussels, in a yellow curry broth with couscous, also went great with the Muscadet, its acidity helping to cut through the creamy curry. I would love to pair this Muscadet with Indian cuisine. 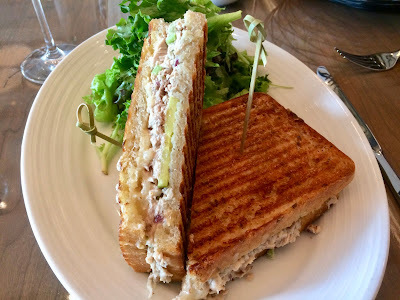 Even the Yellowfin Tuna Melt (one of my favorite lunch dishes at Island Creek) went well with the Muscadet. Again, the acidity of the wine dealt well with the creaminess of the sandwich. Andrew, my good friend and fellow wine lover, loved the wine too! I highly recommend this Sparkling Muscadet, especially at this price point. It is a great summer wine, especially paired with seafood, though it is also versatile and it would work with much more. It may not be easy to find at your local wine shop, but in Massachusetts that shop could order it from Arborway Imports. And if you dine at Island Creek Oyster Bar in Burlington, this would be a great choice on their wine list, especially considering its relatively low markup.